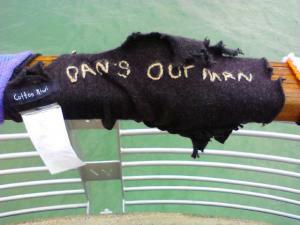 I've just realised that I've been very slack in letting non-Facebookers know that knitted Dan is back. He was stolen from the wharf just over a week ago (poor Miss E burst into tears when she heard he had gone). Being the practical sort, I knitted another Dan. He's been back on the wharf since Friday night, complete with a chain through his middle to avoid any further pinchings. Whilst I was attaching him, I got chatting to one of the cleaning ladies who works at the wharf. She had developed quite an attachment to our knitted tagging and had been holding on to bits and pieces that had fallen (or pulled) off because she didn't know who to contact about replacing them.I was thrilled to discover she had Elmo's missing arm and the missing owl so both got reattached whilst I was down there. Miss E was so pleased to have both arms back on Elmo and Miss M loved seeing the little owls having a hug. If you haven't been to see the Wooly Walkalong yet, it'll be up (hopefully) for the duration of the World Cup. Fingers crossed Dan stays for the rest of that time! Dan's STILL our man. Replacement Dan on the wharf on Friday night, complete with padlock and chain.